For a beautiful and long-lasting tile installation, you need to ensure that every facet of the job is completed properly according to tile industry standards and best practices. The key element here is the foundation of the installation and that's where underlayment for tile solves a multitude of problems. What Constitutes an Underlayment for Tile? In the past, floor preparation materials were not as readily available as they are today. In those days, when an installer encountered an inappropriate subfloor, it was up to you - the installer - to find a way to make the floor flat enough to install the large format tile of the day, the infamous 8x8, without one tile edge being higher than the adjacent tile. The term “lippage” was rarely used if it even existed. Installers in those days needed to be creative in fixing low spots, especially in a wood subfloor. Perhaps using multiple layers of plywood until the low spot disappeared and one of the early generation floor patch products to fill in the remaining spaces. Today, for tiles with all edges shorter than 15 in. (0.38m), the maximum allowable variation is no more than ¼ in. in 10 ft. (6 mm in 3m) and no more than 1/16 in. in 1 ft. (1.6 mm in 0.3 m) from the required plane, when measured from the high points in the surface. For tiles with at least one edge 15 in. (0.38m) or longer, the maximum allowable variation is no more than 1/8 in. in 10 ft. (3 mm in 3 m) and no more than 1/16 in. in 2 ft. (1.6 mm in .6 m) from the required plane, when measured from the high points in the surface. Getting the substrate to within these tolerances becomes a dilemma with today's large format tile sizes. How does an installer fix the floor, so it is flat enough to receive tile? Are there low spots that need to be addressed? Does it also need to be level? Does it need to slope to a drain or perimeter edge? If the floor surface, be it wood or concrete, is not flattened or leveled to meet industry requirements and standards prior to starting the installation, chances are high that problems will be encountered. Likewise, wall surfaces need to be properly prepared to eliminate potential issues. Knowing which ones work appropriately is critical to the success or failure of the project. 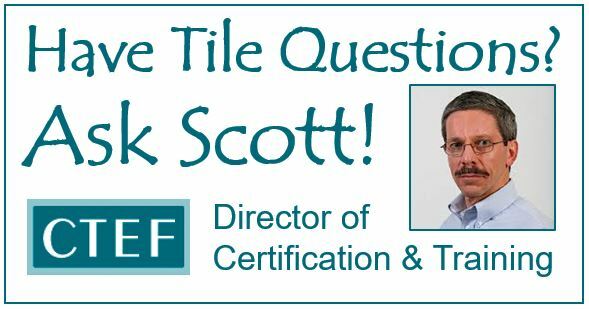 Given the ever-changing and fast-paced appearance of new products on the market means that a tile installer or contractor must stay abreast of these new technologies. Let's examine each category in turn. Backer board, as a category, has been around since the 1970s. The development and mass-production of this product revolutionized the tile industry by providing a tile-ready surface in the form of a sheet or panel for floors, walls, and ceilings. Some of the products in this category fall under an American National Standard Institute (ANSI) designation while others hold an American Society of Testing Materials (ASTM) label. Cement Backer Board was the first product in this grouping. It was originally known as concrete backer units or CBU, a designation still maintained in the ANSI document, and dominated the market for a number of years. Interior installation specifications are housed in ANSI A108.11, while the material specifications are found in ANSI A118.9 or ASTM C1325. Cement backer board products can also be installed on exterior applications as found in the Handbook detail W202E, where the “E” represents exterior. It is the only backer board which is rated for exterior use. Coated Glass Mat Water-Resistant Gypsum Backer Board, as its name designates, conforms to ASTM C1178 and is used in wet or dry areas on floors, walls, and ceilings over wood or metal wall studs or over wood subfloors. Glass Mat Water-Resistant Gypsum Backer Board conforms to ASTM C1658 for use on walls and ceilings in dry areas over wood or metal studs and ceiling framing. Fiber-Cement Backer Board is a dispersed fiber-reinforced cement backer board designed for use on floors, wall, and ceiling in wet or dry areas and is applied over wood or metal wall studs and wood subfloors. General interior installation specifications are found in ASTM C1288. Fiber-Reinforced Water-Resistant Gypsum Backer Board conforms to ASTM C1278 and is used on floors, walls, and ceilings in dry or wet areas over wood or metal wall studs and wood subfloors. 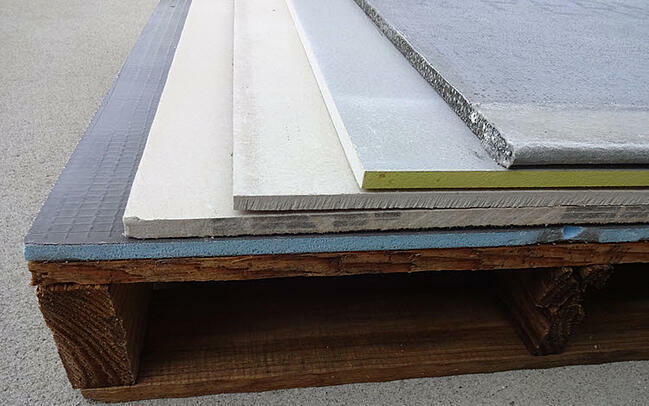 Cementitious Coated Extruded Foam Backer Board conforms to ASTM C578 and ASTM D4068 and is used on floors, walls, and ceilings in dry or wet areas over wood or metal wall studs of wood subfloors. As a general rule on floor applications, backer boards require a supporting layer of thin set mortar or other product, as directed by the manufacturer. Furthermore, fastening the board and seam treatment should strictly follow the manufacturer’s recommendations. Failure to do so can void the manufacturer’s warranty. Realize that often the floor area to be covered with backer board will be irregular or wavy. The only feasible way to correct this deficiency is to flatten the offending area with a trowel-applied patching product. This is extremely important since the patch needs to be under the board, not on top. That's when the next categories of underlayment come into play. To obtain a floor or wall surface that is flat enough to receive tile, surface irregularities need to be corrected per the ANSI Specification A108.02-4.1.4.3.1, Subfloor Surfaces detailed above. In order to meet or exceed these requirements, normally a troweled-on patch or self-leveling underlayment (SLU) is used. The National Tile Contractors Association (NTCA) Reference Manual lists this topic as Underlayments, Trowelable and Poured. Mortar beds were considered the grandfather of underlayments for solving many floor and wall irregularity problems. A mortar bed allowed the tile mechanic to correct the issues with a floor that was otherwise unacceptable or make a wall installation surface plumb and flat, eliminating lippage. Unfortunately, the mortar bed has lost some of its favor because a good quality mortar bed takes time to produce, which jobsite schedules may not allow. Mortar beds can also add significant weight to the structure, which may not be tolerated in today’s tightly engineered buildings. Given the demands of fast-track projects and the get-it-done-yesterday mentality of today’s installations, mortar beds have become less prevalent. These changes have required the industry to make adjustments as well. Somehow, manufacturers had to devise ways to make the unacceptable floor acceptable for a thin-bed installation — and do it quickly. Hence, the newer products and methods detailed in this article. Floor patch materials come from a variety of manufacturers and are used to obtain the required plane for tile installations. This includes filling cracks, voids, rough surfaces and low or depressed areas. Most of these products are latex-modified and require mixing with potable water. These patch products are designed to tenaciously bond to the properly prepared surface and fill low area, also known as bird baths, as well as flatten out high spots. Trowelable underlayments contain cement, aggregate and are mixed with either potable water or a latex additive. Many manufacturers recommend applying a slurry coat of the product to the substrate allowing it to dry until it becomes tacky. The recommended liquid and powder mix is then applied to the surface. Trowelable underlayment usually requires sanding after it dries to remove trowel ridges and allow for an additional layer if needed. Self-Leveling Underlayment, popularly known as SLU, is designed to flatten or possibly level a floor surface prior to installing tile. The floor surface must be properly prepared and primed with the manufacturer’s recommended product and allowed to dry. Many architectural plans and specifications require the floor be level. This is especially true for highly specialized medical and technical equipment that require a perfectly level floor. In this case, provide careful attention to detail when applying the SLU so that, when done, the bubble of a spirit level, laser or transit successfully indicates a truly level surface…. or not. 1. Accurately measure the water for the mix. Too little water can impede the flow of the mixture while too much water can cause the aggregate to sink to the bottom, separating from the other components, yielding a weak and powdery surface. 2. Use a mixer that maintains the proper speed. If the speed of the mixer is too slow, the product will not be properly combined and may not function as specified. Conversely, if a drill which spins too fast is used to mix the SLU, it may begin to set up in the barrel. 3. Mix for the recommended time. Be sure to have enough help to mix, move, pour, and smooth the product within the allotted time. Once the SLU is poured onto the floor, move it into place with a gauge rake having adjustable legs to control the product thickness. When completed, move a surface smoothing tool across the surface to break surface tension and flatten the SLU. Allow the recommended dry time depending on the environmental conditions before installing tile. Poured self-leveling underlayments are composed of various grades of gypsum along with a number of chemicals which control the setting time of the product and may be sanded or unsanded. Depending on the manufacturer’s recommendations, they may be mixed with potable water or a latex admixture. If using a latex additive, it is always wise to use the product provided by the manufacturer. Many times, gypsum-based underlayments are used in conjunction with resilient flooring to patch small holes, cracks or to ramp up or down to an adjacent floor finish. However, they may also be used to flatten the large floor areas of properly prepared wood or concrete. 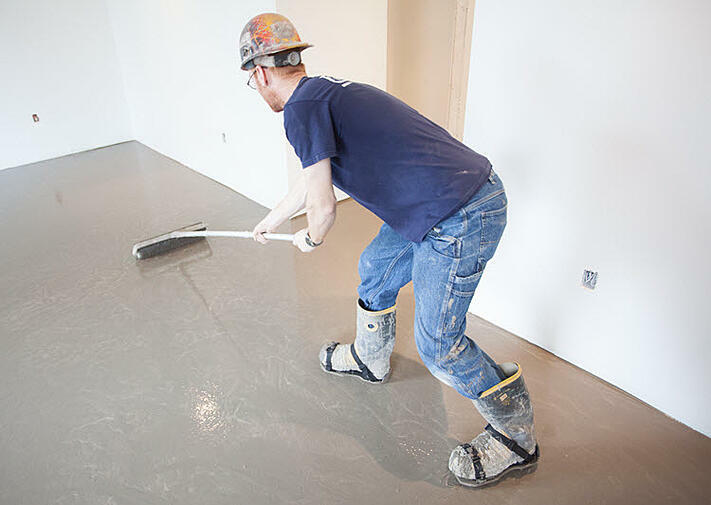 Poured gypsum underlayments can solve subfloor issues such as out of flat and out of level, but they need to be installed per the manufacturer’s guidelines. Structurally sound concrete floors require that the gypsum underlayment meet a minimum compressive strength of 3.000 psi and be a minimum thickness of 1/2”. Structurally sound wood floors require a minimum compressive strength of 2,000 psi and a minimum thickness of 3/4”. All of these applications require that the design load of the structure meet the deflection requirement of L/360. 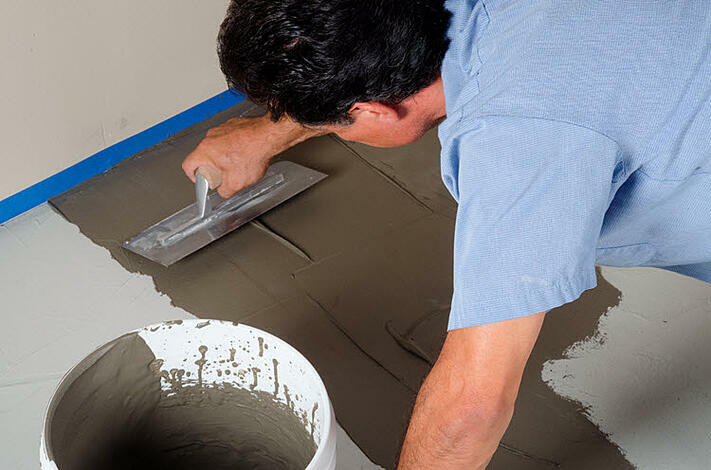 Once the underlayment has been placed by a certified poured gypsum installer, a drying time of three to fourteen days, depending on the thickness, must be observed. Additionally, the site temperature and humidity may be a factor in achieving an adequately dry installation. When the gypsum has dried to the manufacturer’s specifications, the gypsum installer applies the required primer/sealer which prevents the gypsum from pulling the moisture out of the tile setting mortar. This premature moisture removal from the mortar can compromise the bond of the tile to the gypsum. Pourable self-leveling underlayments (SLU) contain cement, aggregate and chemical additives which enhance their flowability and strength. They are mixed with either potable water or a manufacturer recommended latex additive. Substrates are almost always treated with a latex primer which serves two functions. The first is to increase the bond strength between the substrate and the SLU. The second is to prime the substrate which equalizes the absorption rate of the substrate, thus eliminating hot spots which can prematurely dry out the underlayment before it completes it’s designed curing process. SLUs aid in correcting out of flat and out of level subfloors and can be installed from as thin as 1/16” up to 6” with compressive strengths ranging from 3,500 to over 7,000 psi depending on the manufacturer. All of these applications require that the design load of the structure meet the deflection requirement of L/360. Once placed, SLUs normally require between two and twenty-four hours to dry before the tile can be installed. This timeframe will vary based on the thickness of the cement along with the site temperature and humidity. Normally, very minimal prep work is required prior to the installation of the tile. Critical Note: Gauged Porcelain Tile and Gauged Porcelain Panels/Slabs commonly known as GPT require a flat substrate. One of the newest entries to the market has been Gauged Porcelain Tile and Gauged Porcelain Tile Panels/Slabs which until recently was known as thin porcelain tile (TPT). The installation of this product allows the installer only one attempt to set it correctly, since it is almost impossible to slide or lift it once it has been placed into fresh mortar. Here the requirement for a flat substrate, both wall and floor, is critical. The ANSI standard for this product (A137.3) and its installation (A108.19) was adopted in April of 2017 where the substrate tolerances need to meet at least the 1/8” in 10’ standard for tiles with at least one edge 15” (0.38 m) or longer as noted in ANSI A08.02-4.1.4.3.1. It is imperative that the air is expelled or burped out from under the tile and that the trowel ridges are collapsed. This lets little or no allowance for high or low spots in the surface to which the GPT is being applied. It must be corrected before the tile is installed. Waterproof membranes, conforming to ANSI A118.10, are available in sheet and liquid forms and can be used with both vertical and horizontal thin bed and thick bed installations of tile. Some of these products have integral reinforcing fabrics for tensile strength and minor crack-bridging properties. Crack isolation membranes, conforming to ANSI A118.12, for thin-bed ceramic, glass, and stone installations act to isolate the tile from minor in-plane substrate cracking. These products must be load-bearing and bonded to the substrate in order to function properly. In some cases, the trowel-applied products can be used as the adhesive for the tile. Other products within the scope of this category are allowed to cure or are applied as sheet goods and are then used as the substrate for the tile. Uncoupling membranes are generally a plastic product that has some sort of bonding scrim or mesh applied to the back of the product to allow it to be bonded to the wood or concrete floor. The face of product may have a geometrical configuration or a mesh to promote bond to the back of the tile and provide air space between the tile and the substrate to allow independent movement between the two and limit the transfer of stresses. Once in place, their function is to disconnect the tile surface from the substrate to help eliminate cracked tile. Uncoupling membranes may also act as a waterproofing membrane and function well in equalizing vapor pressure conditions encountered in young or newly placed concrete. These membranes are not characterized by ANSI or ISO standards, but must achieve 50 psi or greater shear bond strength in seven days per the test method in ANSI A118.12 Section 5.1.3. Consult the manufacturer’s written literature for specific installation details. Bonded sound reduction membranes, conforming to ANSI A118.13, are intended to reduce the floor-to-floor impact insulation class (IIC) sound. These membranes may be trowel applied, sheet, or composite materials that are bonded to a suitable substrate so that tile can be bonded directly to the membrane. The interesting thing about the products described here is they may need to be used in concert with each other to provide a suitable surface for a quality tile installation. The floor may need to be flattened with a patch or SLU anywhere from just a skim-coat to as heavy as six inches. The surface may further need the advantages offered by a backer board or one of the membranes mentioned above. Underlayments do a great job thanks to manufacturers committed to innovative products that make the finished tile installation look the way it should – flat and lippage free. Whatever the case, always follow the manufacturer’s guidelines and when possible, use products produced by a single manufacturer. These two prerequisites along with using qualified labor, installers who meet the requirements of a Ceramic Tile Education Foundation Certified Tile Installer or Journeyman from the IUBAC, will enhance consumer confidence and ensure a beautiful and long-lasting tile installation. Everyone wins! Have you heard about using CORK for an underlayment for ceramic tile? People are selling it for ceramic tile installations and it goes against everything I have learned over the last 31 years. Can you bring me up to speed? There is only one method using cork as an underlayment for the installation of tile in the TCNA Handbook. Method F135 is installed over on-ground or above-ground concrete using a very specific cork which must be ½” thick (+/-.010”) consisting of a mix of pure cork granules combined with a polyurethane binder, having a density of between 11.8 and 13.6 pounds per cubic foot. The cork must be bonded to the substrate with an A136.1 organic adhesive and grouted with an A118.3 epoxy. The building codes in the United States, IRC for residential and the IBC for commercial installations, does not allow for the structural framing to be altered in order to facilitate the slope required in a shower application. This means that any slope provided must be on top of the framing and must have ¼” per foot slope to the drain. If the installation will allow for additional height, a mortar bed could be used or by using a manufacturer-provided panel. For additional information, please refer to Does Your Tile Slope To the Drain? I want to lay tile over a plywood subfloor in my kitchen/living room. The floor is structurally sound with trusses on 12" centers beneath. Want to be able to have a piano, entertainment center, kitchen table, couch and china cabinet sit on and be moved around on this floor with appropriate protection/sliders. What is my best option for underlayment? I want to make sure it is best for the loads of the furniture. I presume it should also have some waterproofing qualities because of the kitchen. Before any tile installation begins, the ability of the structure to carry the additional weight (of the tile assembly) must be determined. Most times, enlisting the expertise of a structural engineer or architect would be a wise choice. If the structure is adequate, the underlayment should be a part of his or her recommendation. Although not required, a waterproofing system is good choice anytime water is present. Additionally, be certain to include expansion joints around the perimeter and throughout the installation as detail in the TCNA Handbook section, EJ171. >> See Why Do You Need Expansion Joints When Installing Tile? How to Match Floor Heights? As mentioned in the above question, determining the ability of the structure to carry the addition weight of the tile assembly is critical. The design professional should make specific recommendations for vapor retarding membrane, crawl space ventilation, which TCNA Handbook method would be best suited for your installation. Be sure to include the required expansion joints as detailed in the Handbook section EJ171. Concrete tiles for a roof are not a part of the ceramic or porcelain tile standards and methods. It would be best to get recommendation (in writing) of the manufacturer of the available product as to its suitability and warranty before proceeding. ½” or ¼” Cement Backer Board Under Porcelain Tile? Scott, I have a commercial project in a historic building in Washington, DC. The current flooring (hardwood) has been removed and new ¾” plywood has been installed, with the total subflooring being ¾”. I’m recommending installing an additional 1/2" cement backer board over the plywood prior to the 12" X 24" porcelain floor tile. Is that a good method? The architect is recommending a 1/4" cement backer board. Thanks, Gregg Moore. As the design professional, the architect would be the person to design an installation system appropriate for the historic structure. Whether the backer board thickness is ¼” or ½” would be up to the combined expertise of the architect and the backer board company. To be certain everyone is on the same page, get the recommendation in writing. How to Deal with Transitions From One Tiled Floor to Another? My husband and I are installing a 13"x13" x 3/8" tile. We have a 3/4" transition to deal with and want to keep it continuous tile. We want to make a nice gradual transition of about 5" wide made out of tile to connect the two areas (hallway into a reading room). We thought we could support the tile with an angle cut piece of plywood underneath. How do we make a nice transition that won't hurt bare feet? We're worried cutting the tile on an angle will give it a sharp edge. Any suggestions? Thanks for your time. A tapered piece of plywood may be difficult to fabricate and may not offer the support required for a good installation. If the structure is adequate, the use of a cement-based floor patch that allows for the needed height may be the best choice. Once properly in place and cured, the tile can be installed. At the two angles, especially the one at the high point, ease the cut edge with a rub stone to eliminate any sharp edges. Also, at this intersection, it would be wise to fill one or both of these joints with a C920 sealant such as 100% silicone or urethane. Why Are My Tiles Breaking, Coming Loose and the Grout Cracking and Coming Out? Built in 2015. I used TGIs 16 inch on center with Menards 3/4-inch exterior water proof 5 ply plywood as my sub floor. After nailing it down every 6 inches apart with PL 400 construction adhesive, I let it set for nearly 6 months before the tile installation. My tile setter used a 1/8-inch V-notched trowel placing the thin set before screwing down 1/4-inch Dura Rock. He then used a 1/4-inch notched trowel placing the thin set before installing the 12 x 24-inch tiles. Within 1 year after the installation, many of my tiles have broken, grout lines have cracked with the grout coming out and many tiles coming loose. Do you have any suggestions for me? I am going to remove all tile, remove the dura rock and re screw the sub floor next spring and start over. I probably sound like a broken record, but was the floor system designed to carry the weight of a tile assembly? The problems you outlined are either the result of movement in the structure, the lack of movement accommodation (expansion) joints, or both. If structure is not properly rated, you will need structural engineer to assist in a remedial plan. If the structure is adequate, meeting the required L/360 deflection specification, it is time to start again. Does the plywood have tongue and grooved edges? Was the required gap between the sheets provided? What is the moisture content of the plywood before installing the backer board? What is the moisture level of the area below the floor structure? If this is considered a dry area, was the mortar coverage on the back of the tile at least 80%? Were or are you including the necessary expansion joints? You mentioned the use of a 1/8” notched trowel for the mortar under the backer board. This is not sufficient and should follow the manufacturer’s recommendations. I wish you well on the replacement. How to Respond to a Customer Requesting Thin Set with a Wire Mesh Over a SubFloor? First off, if mold is a part of this scenario, someone needs to hire a mold remediation expert and eliminate the problem. These folks are trained and insured to handle mold properly. The only TCNA detail that includes wire mesh would be F145 which includes expanded metal lath with a minimum weight of 2.5#/square yard installed over a cleavage membrane and a mortar bed thickness of 3/4” minimum to 1-1/2” maximum. Realize that this will raise the level of the floor which may not be acceptable at a transition. Sometimes when the consumer dictates the installation method to be used on the job to the installation expert, the best course of action would be to walk away. Final Note: Beware of Using Thin Set to Cut Costs! Unfortunately, some not-so-well-trained or poorly informed tile placers (not tile mechanics or installers) mistakenly believe that whatever is in the back of the truck or left over from the last job is appropriate to patch the low or high spots. This is entirely wrong! Thin set or even the newly designated large and heavy tile (LHT) mortars are not designed to repair these surface irregularities. Consumers should be wary of contractors who say that underlayment products are not needed and add unnecessary cost to the project. >> See Looking to Hire a Tile Installer? Here's Your Roadmap. Watch out for this one… It's a recipe for failure from the beginning. The least expensive price for the job may be the most expensive in the long run. Note: This article was originally published on June 6, 2017 and has been updated.